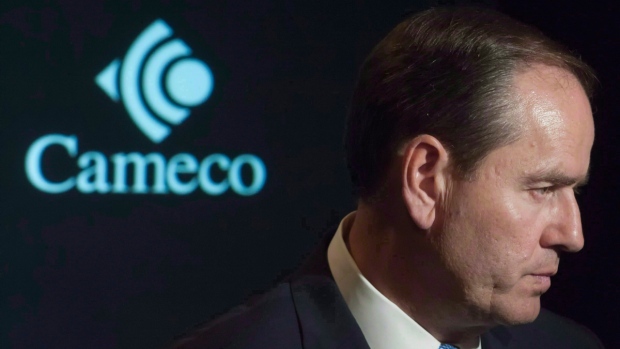 Cameco (TSX:CCO) has reported a double-digit increase in fourth-quarter profits despite a nine per cent drop in revenue. The Saskatchewan-based uranium producer says net income attributable to shareholders in the three months ended Dec. 31 was $73 million or 18 cents per share. That was up from $64 million or 16 cents per share even as revenue fell to $899 million from $977 million. Adjusted earning were $205 million or 52 cents per share, up 37 per cent from $150 million or 38 cents in the prior-year period. The company attributed the improved performance to higher average realized prices for uranium and a lower average costs of sales, along with a favourable $37-million settlement involving a dispute over a long-term supply contract. It also reported lower exploration expenditures and a higher income tax recovery than in the prior-year period. For the full year, Cameco said net earnings were $185 million or 47 cents per share on almost $2.4 billion of revenue, down from $318 million or 81 cents per share on revenue of $2.44 billion in 2013. "The uncertainty in the uranium market has persisted for longer than expected, but 2014 was another year of strong financial and operational performance," said president and CEO Tim Gitzel. "And when we look longer term, we continue to see exceptional growth on the horizon, as billions of dollars are being invested in reactor construction around the world -- reactors that will need uranium," Gitzel said. Work to battle the wildfires wouldn’t be possible without the help of hundreds of volunteers. 10-foot Santa rescued in P.A.